A team of German physicists with TU Dresden has independently tested the feasibility of the EmDrive and Mach Effect Thrusters. They have presented their findings at this year's Aeronautics and Astronautics Association of France's Space Propulsion conference. The EmDrive is an experimental space engine design that came to light several years ago. It gained some prominence two years ago after NASA reported a team had been testing the engine to find out if it had merit. That team has not presented its findings, which led the team in Germany to test the idea for themselves. The idea behind the EmDrive is simple—it is a hollow cone made of copper or other material and placed in a frame. Natural microwaves bouncing around inside the cone are supposed to provide thrust. If feasible, such an engine could push a rocket through space without the need to carry fuel. But as many physicists have pointed out, such an engine would defy the laws of physics as we know them. 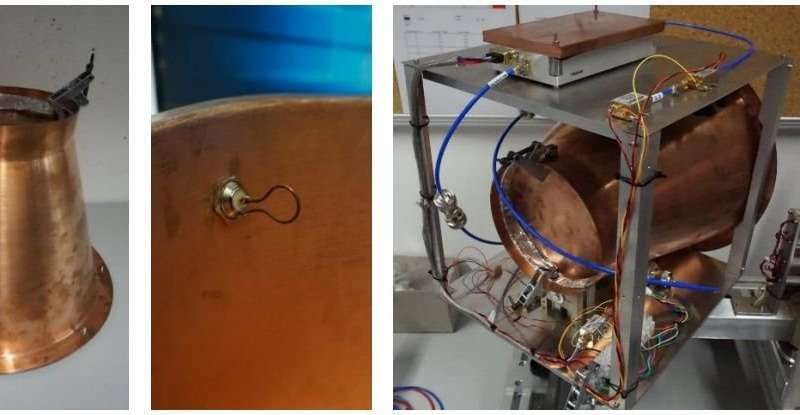 To test this concept anyway, the team in Germany built an EmDrive similar to the one NASA had looked at (a leaked paper offered some details), set it inside a highly shielded vacuum chamber and fired microwaves at it. They report that while the EmDrive did experience thrust, the thrust did not appear to come from the engine itself—there was thrust no matter which direction the engine was pointing, suggesting it originated from a secondary source, possibly magnetism from the Earth. Mach Effect Thrusters have a stronger basis in known science, but are still considered to be an unlikely proposition. They are based on the idea that fluctuations generated in a piezo-crystal stack will create non-zero time-averaged thrust. The researchers in Germany built some for testing in their vacuum chamber, as well. They report that the results were more promising than for the EmDrive, but there is still not enough evidence to show such an idea might work. They found that the thrusters did provide thrust and they did it in the right direction. They also noted that thrust ceased when the thrusters were turned off. But they also found that the thrust produced was approximately 100 times more than was predicted by theory. Also, throwing the thrusters into reverse did not work, either. The researchers suggest there was likely an outside factor impacting the generated thrust. They report that while the EmDrive did experience thrust, the thrust did not appear to come from the engine itself—there was thrust no matter which direction the engine was pointing, suggesting it originated from a secondary source, possibly magnetism from the Earth. create one container with matter that has positive orbiters and another with negative orbiters. carefully control the field and pressure and volume when mixed, i.e. avoid the walls. route the accelerated positive plasma through one pipe and the accelerated negative plasma out the other. Because the entire design is based on a basic misunderstanding of geometry, it would have been shocking if the EM drive did work. The "inventor" asserted the use of sloped sides in a completely enclosed cavity with microwaves would result in one end recoiling harder than the other, resulting in a net force, or some such thing. If that is correct (it clearly isn't) you could replace the microwaves with oscillating mashed potatoes and get a net force. I am optimistic we will find a way to develop something like warp drive some day, but I remain confident it will not violate the bedrock principle of conservation of energy. BTW, you would be better off simply taking one of the ends off so the microwaves could escape. Note: Using positive charge as a catalyst will also work if a source of dense matter. Previous method is more robust. In other words rocket design with a better fire. Me? I 'm waiting for the vast international conspiracy against crankery to permit the construction of an apergy powered antigrav device. And before you point out that an antigravity device is by definition an exploding bomb? You got damn fools demanding nuclear powered rockets be used to launch from the Earth's surface. Cause why not? Plenty of other planets out there if we stupid apes poison this one. Right? Right! Well, MR smarty pants, and your amazing dismissive brain powers ..the EM drive thruster has been tested by many governments and large organizations, like NASA. And none of them are dismissive of the device or its potentials. You got damn fools demanding nuclear powered rockets be used to launch from the Earth's surface. The nuclear rocket is intended for in-space only propulsion. Besides the possibility of leaked radiation, I recall the thrust to mass ratio is too low in most configurations. For a good rocket engine, you want high specific impulse (efficiency), high thrust and a high thrust to mass ratio. The nuclear rocket tends to be weakest on the last one. One paper I read said their nuclear engine was too heavy to get off the ground, but excellent for in-space propulsion. Quantum says differently... quantum says multi-vectored 'violation' in all well done tests, so far. Microwaves in a can like that are operating at a almost purely quantum level. ...you could replace the microwaves with oscillating mashed potatoes and get a net force. I desperately want to see this experiment and paper! I spit coffee everywhere laughing at that! Even if the drive has no application but in the Gravity Well of Earth, that seems like a useful thing to know about. Surely you could create a power generator based on harnessing one or more of the natural fields around the planet. Like tidal energy, but more general. That would be a bit like the mythical "Ether" that free energy enthusiasts and alchemists are/were always trying to tap into. Captain Stumpy, sorry for the mess, but I am laughing with you! Thank you for your comment. I am told by a Physicist that this EMDrive by Tajmar had a Q factor of 50,000 so he should have been getting about 190 microN and he was only getting 4uN so this is NOT a working EMDrive! I would think this would have been picked up by now! The Report is Flawed! I'm at MIT, and we (a bunch of physicists) discussed this over food when the EM drive stuff first started. Literally nobody thought there was any chance it would be real. So you should have said "And ALL of them are dismissive of the device or its potentials". Because the entire design is based on a basic misunderstanding of geometry, it would have been shocking if the EM drive did work. The "inventor" asserted the use of sloped sides in a completely enclosed cavity with microwaves would result in one end recoiling harder than the other, resulting in a net force, or some such thing. I read an article about the Dresden university and their results. If I read it correctly, their conclusions were that there was local interference and they couldn't shield the test from the Earth's mag. field. They apparently intend to retest but using mu metals. Interesting research though because if we are to start thinking of traveling far then we need engines 'better' than those we have at present. Thank you Mark Thomas for clarifying that nuclear powered rockets are a no go from the Earth's surface through the atmosphere into orbit. And I agree that in space, nuclear powered vessels and installations (robotic) are a reasonable alternative among the dozens of proposed methods of transportation. As for wishing the EM drive to pay off? Please don't pester me for funding. The MET sounds possible. Though I would want testing done in orbital micro-gravity. Perhaps the Mach Effect Thruster, if not as a main propulsion engine? Will prove usable as auxiliary equipment? For instance, writers of fictional space flight invariably ignore what happens to the plume of reaction exhaust mass left behind. And why would anyone believe it would just magically evaporate? Maybe the exhaust/plasma will disperse to just being a minor pollutant on orbit. And maybe not. After all, most of the spewing traffic will be in the same LEO orbits as satellites and habitats. rjwillsj, Actually, on the exhaust not being dealt with in Sci-fi, try looking at Larry Niven's 'Man-Kzin Wars' series where Kzin (a feline, meat eating far ranging space civilization with slave races for labor and food) find Humans who have gone peaceful, mostly, and the Kzin (who use a fantastic gravity drive) are totally astounded when the Humans turn their fusion rocket exhaust on them, effectively slicing the Kzin ship in half. This is later called the Kzinti Lesson, that a fusion drive is as effective as a weapon as it is as a drive. There have been other authors use similar situations, but ever since Buck Rogers there has always been the take off and landing blasts as well as the dangerous exhaust behind. Star Trek seems to use a force type drive with no physical wake, but that is a different scenario completely. Cool. Of course that is why tokamak designers put so much effort into containing the fusion reaction with magnetic fields, because any known material would not work. With current technology the every force has an equal and opposite force means we want the thrust to have as high as velocity as possible to maximize or thrust per mass. That is why the ion thrusters are great for space. But, don't have enough kick to get you out of the gravity well. I was wondering if you could use the Bernoulli principal with chemical rockets to get an extra kick out of your rocket. You would need a rocket that could contain the extreme heat and pressure of course though. It seems to me you would only be limited by the materials. Theoretically, we could eventually use energy such as sunlight and covert it to matter and antimatter pairs and then use those as your thrust mass. Maybe someday we would have the technology to do that. SSteelwolf, yes writers have described using propellant exhaust as weapons. Though if I remember correctly? The originating story of the Kzin war, used a microwave emitter communication device as a weapon? However, what will be the effect of hundreds, maybe thousands of maneuvering vessels and facilities in a tight orbital plane, constrained by EM fields and currents? Kinda brings to mind the rings encircling the gas giants doesn't it? That is why I suggested following up on the possibilities of the propellentless Woodward Mach Effect Thruster. Perhaps it will not be capable as a full-on engine to move large masses. But maybe useful on a small scale. Such as steering jets for vessels, EVA suits or auxiliary equipment. That in a crowded orbit would not be interfering with other ships or satellites. And not risking damage to nearby people or equipment. Or leaving behind a growing cloud of propellant gases, metal dust and plasma st elmo's fire. ZoeBell, I read the first prototype was a magnetron from a store-bought microwave oven placed in a sloped metal cone with flat ends. This is not rocket science (pun intended). Shawyer's explanation for how it would work based on geometry is simply wrong. In the article above, the scientists tested it and it did not work. As Mimath essentially pointed out, we need stuff that actually works. If you want a hard sci-fi propulsion technology, you might consider antimatter-initiated nuclear pulse propulsion. Lots of very hard engineering hurdles to overcome, but it works in accordance with the known laws of physics. Not sure but that posters are confusing 'nuclear rocket' with 'nuclear explosive propulsion'. The former uses something similar to an RTG on steroids to superheat a fuel and eject it out the nozzle to generate thrust. The latter is the basis for Project Orion, which would explode a series of fission or fusion bombs behind a 1,000 ton pusher plate. Orion was designed to lift a payload of 1,000 (fission) to 3,000 (fusion) tons to orbit from the surface, the weight of 2 to 6 **battleships**, in addition to the 3,000 tons estimated vehicle weight. Estimated human deaths worldwide per launch of each fission-powered Orion due to extra exposure to radioactive elements were under 10. That's far, far below the number of deaths per year caused by a large coal power plant, but was sufficient to scare politicians away from the program. Wasn't there an episode in Star Trek TNG where continuous passage of ships at warp endangered some species or other. Perhaps I got it mixed up somewhere but do you remember such? Mimath224, do you mean Star Trek TNG Season 7, Episode 9 Force of Nature? Could be. I seem to recall that some planet or other was on regular star ships path and something to do with the continuum being affected by warp drives. Can't say I'm completely accurate though. Actually my point really was that perhaps in that episode the writers were suggesting that warp drives might affect the environment in analogous way of potential dangers of present day technologies. Whether that is valid or not I leave to those more knowledgeable in those topics. Mimath224, that is the episode. I recently rewatched the entire Star Trek TNG series on Netflix. There are so many things to like, such as exploring a serious topic like this. Star Trek is NOT riddled with gaping plot holes or ridiculous inconsistencies like most shows and "thrill ride" movies. I get to keep my brain "on" for Star Trek and enjoy imaging I am seeing future history playing out. Mimath224, to be clear, when I wrote, "exploring a serious topic like this," I did not mean that literally. Star Trek is well known for "morality plays" and cautionary tales going back to the original series. This show talked about damage to the fabric of space-time, but that was a proxy for environmental damage. It could have been about too much visitation to our beloved National Parks. Some have described that as loving our parks to death. It was great to watch Captain Picard wrestle with this issue because he represents our better selves here. Galactic space travel, Newton's inertial acceleration is in his laws of motion and acceleration. As long as everyone is diverted by these space drives, emm drives, ion drives and laser when everyone is distracted from rockets - work continues apace on Isaacs Newton's inertial acceleration under every one's eyes because that is the most invisible place because even though you know you also know it's the place everyone does not look with the end result, it's the most secret place to work on Newton's inertial acceleration is under every ones nose's. And what irks all space travel proponents, Newton's inertial acceleration as Isaac Newton's laws were written in the confines of space and time in Isaac's mind that is where the secret Isaac is hiding to the secret of Galactic space travel - In his laws of motion and acceleration! Newton? We know the field. Can we design our own inertial frame within the wall of a vessel? Also, note: acceleration a 1 G for about a year, you'll be a light speed. If your ship is painted with hardened nanobots as you move near suns and galxies, you may utlized icident Fields and charges. Yes, Gene Roddenberry was good at getting away with contemporary issues by hiding behind futuristic scifi. However, do you think there's any chance of disturbing say, the Space-Time continuum, if Alcubierre drive or similar ever became a reality. If we found a way of 'using' the s-t continuum to get around f.t.light travel might there be some disruption...at least locally? Just thinking aloud that's all, ha! Ha I remember when I read this. Man was a genius. Humans gathered up nuke weapons from around the world and built a huge orion-type ship in secret to end the siege of earth by little elephant-people. The launch was notable, and as usual, niven the scientist did the research to make it believable and authentic. -which of course is ridiculous. Many sites out there with calculators for those who do not lose interest as quickly as otto. -So why didn't you die of insipid-poisoning? I was walking through a flea market yesterday and saw a guinan/whoopie action figure and got vertigo. Puke. As a Scientific Community, many never know when to take it off-line. Disrespect is never a means to an end within an illogical disrespectful crowd. I think there is a tautology in there somewhere that also relates to reflecting the field. There is an abundance of knowledge looking at what can be gained from 'nothing', you know, after all the bull$hit disappears. excuse, meant verify a possible container? First, what's happening, anywhere? First calculate where are the losses. It will be added when we size the sail or define a rocket and can it be overcome? What are the controls? intensity, frequency? Well we know copper pretty well, and frequency, what changes? We can start with cavity? Why not ellipsoidal? Sure, about geometry? So, can the field be polarized as perpendicular to the surface. Since fields don't effect fields, where's the next spot? Focus! exactly, what are you talking about? this, if rf is placed into a partial Faraday cage, is there thrust? I'm sorry, you feel disrespected? The EmDrive has been around the internet for years, it still did not work then. Even the ones that work don't work as they only apparently work – well it's the internet, any things possible on a YouTube video!